When thinking brings pleasure. When thinking brings pleasure? : Dr. Voroshilov: a peek inside. When thinking brings pleasure. When thinking brings pleasure? This Blog is a part of my media social experiment. Comments, suggestions and questions are welcome (vv.free.physics@gmail.com). For the specific lists of posts use links on the right. For consulting services of Education Advancement Professionals visit www.GoMars.xyz. Thank you for visiting, Dr. Valentin Voroshilov. Vision v. Imagination: what does a venture capitalist use? Dr. Voroshilov: a peek inside. I hope this post will help you to learn better what kind of a person I am. I am a professional educator. I am an expert in human intelligence. I am a very open person. I say (write) what I think (unless it would greatly jeopardize the well-being of my family). I am not an idiot or a reckless person. The reason I can allow myself writing what I think, even if that is perpendicular to commonly adopted and conventional views, is that my financial situation is sufficient and stable. Of course, as a normal person, I wouldn't mind making more money, or being involved in more interesting projects (as described in my generic resume). But I do not have to pretend to be someone I'm not to make my living. I am aware of the fact that my chance to find many professionals with similar views is slim. The demand for "professional correctness" is taken to such an extreme that it has become the demand for personal conformity. I also know that the chance of my writing to have any effect is almost zero. But if the things are not getting any better, at least I know - I tried. The way I sound (or read) may be different from the way people talk (or write) in other cultures, but I never want to make people I talk to feel bad about themselves (sometimes I may want to nudge a person to think about some tough questions, but that's that). Some people say that I have a dry sense of humor. I think it is better than having no sense of humor at all. Here is what I got so far. I am absolutely convinced that any extremism is bad. Any idea, even a very good one, if taken to its extremes becomes its own opposite. Every good idea can be severely compromised by its poor implementation (which is often happen by taking it to the extreme). That is why I am extremely anti-extremist. Below is how I want to see myself (of course, the reality puts its limits and corrections; there is always a difference between how we see ourselves in our dreams, and in a mirror). I was lucky to work side-by-side with extremely smart and educated people, including my mentors - people who taught me that there are only two rules for becoming a master: 1. learn from the masters; 2. constantly push yourself. My mentors had an incredible knowledge of human nature. People, who “by a single look at a raindrop could deduce the existence of the oceans”. People, who walked toward a challenge and found a pleasure in solving complicated problems. People who would tell things as they are. People who taught me what does it mean to be a professional, including the five top professional qualities: curiosity, imagination, an ability to reason, an ability to laugh at themselves, and having strict criteria for the quality of their own work. The type of people to whom I feel deep admiration and respect. *Always be polite but no one can force you into being nice to them, that's your choice. * Truth cannot upset, whatever emotions a fact excites in you - it's on you. * An idiot needs to know he/she is an idiot. * Don't chase people, your people will find you. * Don't try to fit-in just for the sake of being accepted. Choose your circle wisely, it will bend you into one of the everyone. * Better be right than wrong, but better be honest than right. * "Brevity is the sister of a talent". The last one actually came from under a pen of a genius Russian writer Anton Chekhov. I use it in my teaching practice. I always try to explain things as clear as possible using as few words as possible - that what cognitive efficiency is. However, in my years of living in the U.S. I have not seem this tradition being practiced. 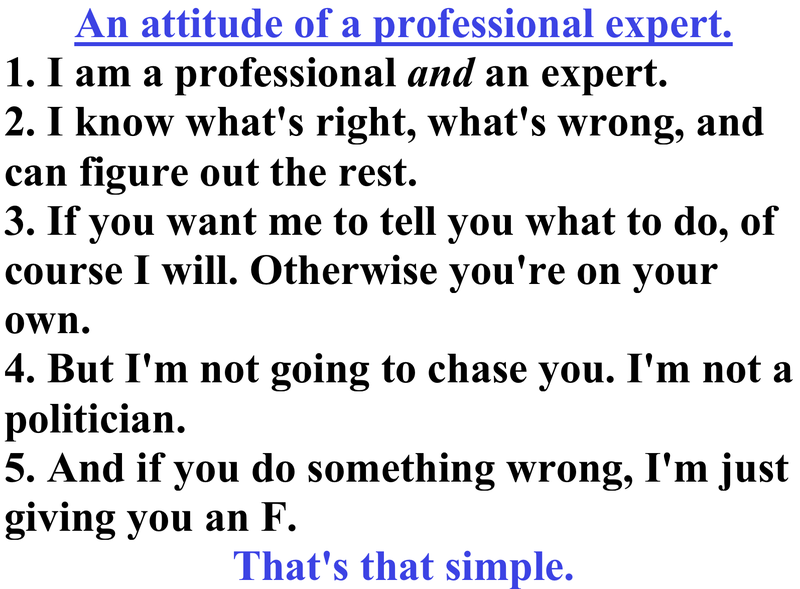 A Master is an expert professional. 2. Never stop pushing yourself. 3. learn from mistakes (sh!t happens). Everything else, e.g. opinions, traditions, views, emotions, is relative, hence irrelevant. History of science demonstrates that even the most widely accepted views can (and did) become outdated and be replaced. As a long-term teacher, at times I may be judgmental, and may challenge people, but I have trained myself to keep it down. As a person of science, I believe, there should be no gaps or disconnections between laws, moral rules, and the actual social culture (a physics teacher is a diagnosis!). There is a type of people who I try to avoid: people who are arrogant, full of themselves, believe they know everything and tell everyone what to do, people who try to avoid logical conversations and always silence the opponents by loudly screaming emotional trivialities and calling people names. Those people, who do not represent the majority, may come in all possible forms: all genders, races, ages, wealth, education, status. Those people demand to be treated with the utmost respect, but do not respect anybody else. 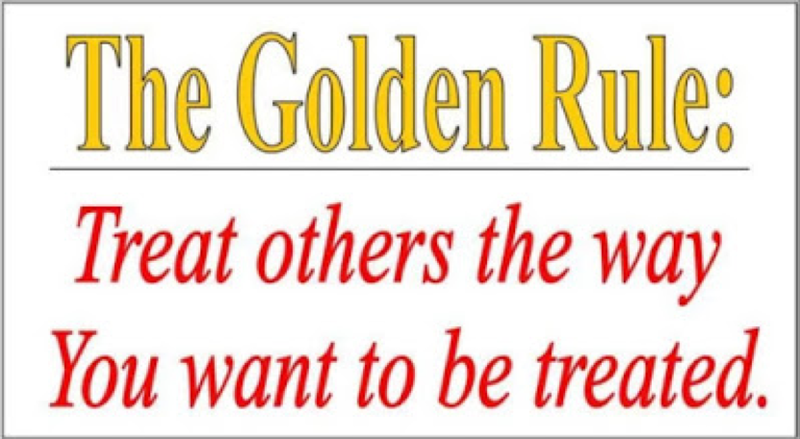 Those people break the Golden Rule, but often demand that it would be used toward them. The Golden Rule does not mention race, gender, ethnicity, age, IQ, education, wealth, religion, political bias, the planet of birth. I guess, this is one of the reasons Stephen Colbert (I like him, but not as much as I liked Jon Stewart) repeatedly has said "I do not see race". Well, following this logic, and the Golden Rule, we all should say "I do not see gender", "I do not see ethnicity", "I do not see IQ", "I do not see age", "I do not see education", "I do not see wealth", "I do not see religion", "I do not see political bias", "I do not see an alien". - an ability to see how other people see other persons - a.k.a. imagination. - an ability to see how other people see himself/herself, a.k.a. reflection. - the willingness for "trying on someone else shoes", a.k.a. caring. Ask anyone "Do you want to be lied upon, told untruth, deceived?" The natural asnwer is "No, I don't". 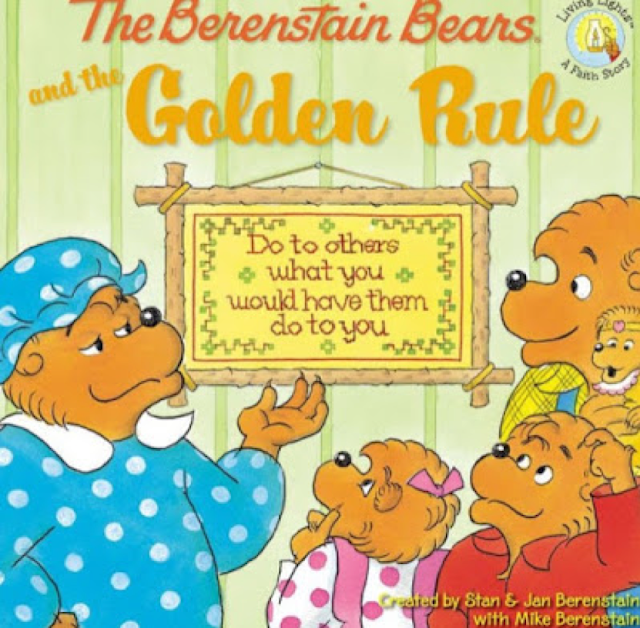 But that means that when one lies one breaks the Golden Rule. Ask anyone "Do you want to be used by others as a tool, as an instrument for their benefits, as a step in their life ladder?" The natural asnwer is "No, I don't". But that means that one who uses people as tools, instruments breaks the Golden Rule. "Question always; question everything; question everyone". "Everyone is good at something. No one is perfect. If you accept yourself as you are, opinions of others will not matter to you anymore." "Life is a dynamic adventure. 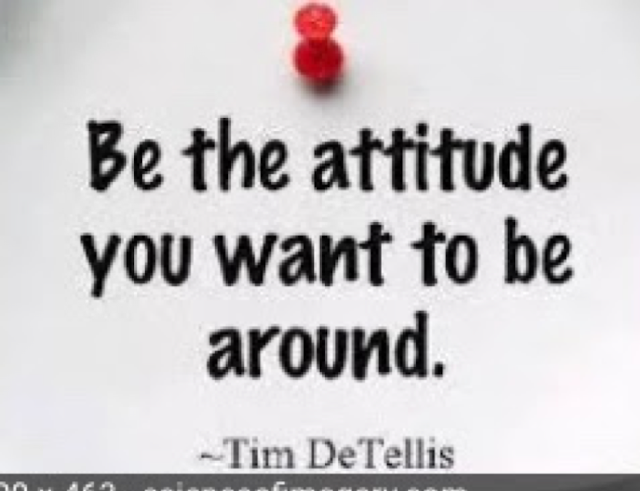 No matter how good you are now, tomorrow you'll become less adequate. Self-improvement comes from the difference between who you are now and who you want to be tomorrow. This requires two abilities: an ability to reflect, and an ability to project. Neither comes naturally from birth; each must be learned and trained by an experienced coach." "Mistakes are inevitable and unavoidable. There is no shame in making a mistake. The shame is in insisting that you're right even when even you already know that you are not." 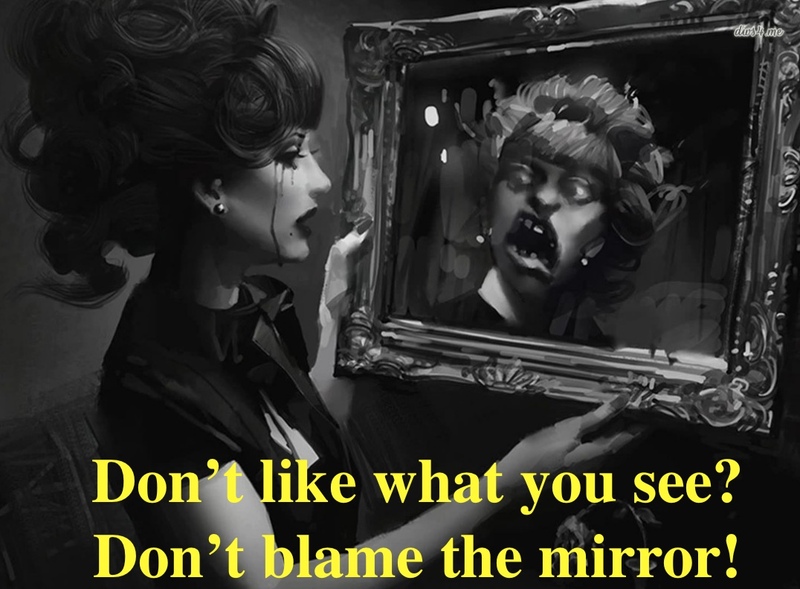 “If you look in a mirror, and do not like what you see, do not blame the mirror.” (technically, the origin of this saying is folk wisdom; BTW: a mirror is an object or a person interaction with which activates the process of reflection on (a) personal appearance; (b) external environment; or (c) internal psychological state). "There are people worse than evil geniuses: aggressive ignorants and arrogant idiots. Only good public education can bring their number down to a socially tolerable value". I am a successful professional. I have my share of achievements (as well as mistakes), and I am proud of those achievements. It shows that I am not just someone who "says the right things". I also do the right things (at least try my best). 1. go to www.Cognicity.How and just scroll down the page, to get visual representation of the topics I am interested in, and also my productivity. 2. go to www.Gomars.XYZ and do the same. 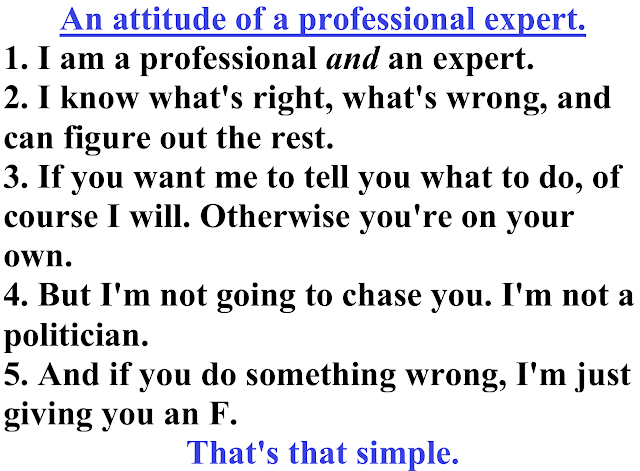 3. go to "The Proof of The Professional Success" and read it. Well, after the first couple of pages of the student feedback one can jump to the Elevator Pitch, and the rest. "The Importance of Early Exposure to Thinking"
"Is The Cat Worth To Be Saved?" "Relax! The Real AI is Not Coming any soon!" "The Biggest Lie of The Humanity"
Of course, I would like if everyone would read at least the third of my posts on this blog, but that is a wishful thinking. I know I am not "the most interesting man in the world". But I hope that this short introduction at least will make me to be seen as just interesting. I said in the title of this blog that this blog is a social experiment. This blog is a social experiment with the way I bring enjoyment in my life. There are many sources of enjoyment in life. For examples, adults are enjoying themselves when the play with kids “I got your nose”, or “Where is the thumb?”. And that's what I do when I write my articles - I'm enjoying myself. I don't write for people who are dull, or ignorant, or arrogant, or insecure. I write for people who have a sense of humor, who can take a joke, who feel good about themselves, and who know that they have limits, like everybody else do.